In the ternary complex (E-DNA-dNTP) of HIV-1 RT, the side chains of two aromatic amino acids, W24 and F61, located in the fingers subdomain, interact, respectively, with +1,+2, and +2,+3 template nucleotide overhang; in the binary complex, their interaction with the template overhang is not known. To explore the interaction of these residues on the productive binding and polymerase activity on template primer with varying overhangs, we substituted W24 and F61 with conservative and nonconservative residues and characterized the biochemical properties of their mutant derivatives. Both the nonconservative mutants, W24A and F61A, were severely affected in their binding affinity for the template primer in the E-TP binary complex, while their E-TP-dNTP ternary complexes were significantly unstable as compared to the wild-type enzyme. The kinetic parameter revealed significant increases in Km dNTP for both W24A and F61A mutant, with 86%-99% reduction in their catalytic efficiency. In contrast, the conservative mutation at position 24 (W24F) had no effect on template primer binding and polymerase activity of the enzyme, while a moderate effect was noted with conservative mutation at position 61 (F61Y). 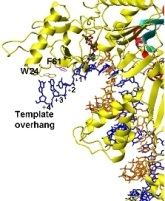 Specifically, both W24A and F61A mutants were severely impaired in their template primer binding affinity and polymerase activity when a template primer had a single +1 template nucleotide overhang, indicating a possible role of these residues in stabilizing and positioning of the +1 template nucleotide in the dNTP binding pocket. The Ala substitution at these positions appears to confer rigid conformation to the dNTP binding pocket, resulting in higher fidelity and lower sensitivity to ddNTP analogs. On the other hand, only moderate changes in fidelity and ddNTP sensitivity were noted with conservative F61Y mutation, while no change in fidelity and ddNTPs sensitivity was noted with conservative W24F substitution.